Father David Guffey, C.S.C., is the National Director of Family Theater Productions and our Head of Production -- and he also writes movie reviews! Here he examines "The Nun," the latest film in "The Conjuring" universe, which is proving a hit with audiences. The Nun was the box-office favorite of last week ($54 million domestic). Starting with The Conjuring, The Conjuring 2 and the Anabelle films, this is the sixth film in The Conjuring series from producer James Wan, which feature demonic possession and the people brought in to expel it. As with other films in this series, there is a willingness to admit that evil exists in the world and that it looks for opportunities to insert itself into the life of unsuspecting, usually vulnerable people. The Nun is rated R, mainly for gore, so it is not a kids' film. The posters and trailers make it look as though it will be a hit job on the Church. If you see the film, reserve judgement to the end. You may be surprised, as you find that people of faith are the protagonists in the struggle to contain evil. 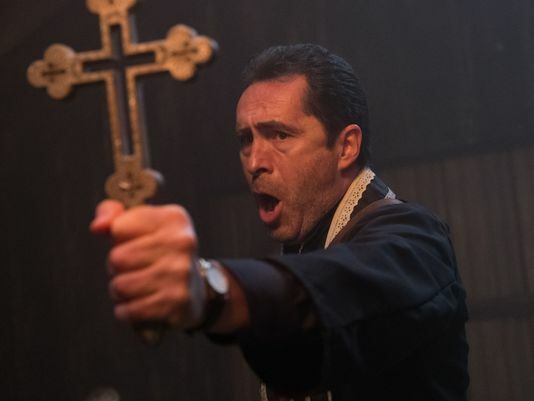 The Nun begins as Father Burke (Demian Bichir) is summoned to the Vatican and assigned to investigate a recent suicide death in a remote Romanian convent. From the look on the cardinals’ faces, there is more to it, but you knew that from the posters. Sister Irene (Taissa Farmiga), a novice who has yet to take final vows, accompanies him. They travel to a mountainous area in Romania, guided by Frenchie (Jonas Bloquet), a local character who discovered a nun hanging from a ledge outside the convent walls. Inside the walls, awaits a Gothic scare fest. The order of nuns holds evil at bay by their “Perpetual Adoration” (though there is no sign of a monstrance or a clear understanding of the Eucharist). 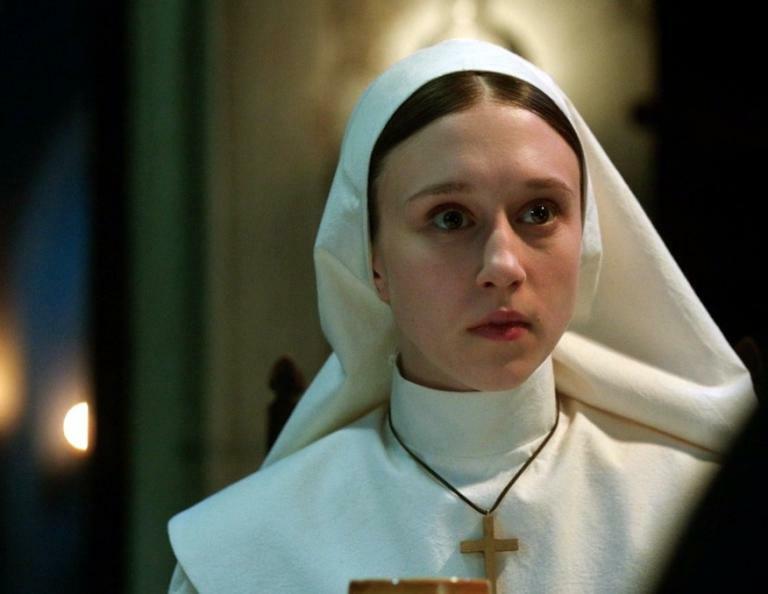 Father Burke and Sister Irene work to solve the mystery of the convent, as they avoid the Demon Nun, which we first saw in a painting in the home of Catholic exorcists Ed and Lorraine Warren (played by Taissa’s sister, Vera Farmiga) in the first film in The Conjuring series. Then the Demon Nun itself showed up in The Conjuring 2. This vision clearly influences the design of the sets and lighting throughout the whole film. Shadows are thick with bits of light as the only guide and hope. There is, however, light. Light shines through the faith and courage of the good guys (and nuns). Bichir portrays Father Burke as a humbled man with a centeredness and sense of resolve. Farmiga’s Sister Irene brings light to the film with a sense of innocence and confidence that evil can be overcome. As a Catholic priest and a member of a religious order, the film’s lack of Catholic cultural authenticity was striking, probably more so to me that the average church-going viewer. As a filmmaker, I would argue that more attention to the some of the customs, practices and objects of priests and sisters might have added texture to the beautiful production design, helped give more depth to the characters and accentuated the ultimate conflicts of the film. The Nun would be a better horror film if it had been written with more Catholic details to add to the contrasts of darkness and light. Nevertheless, it a watchable and exciting film. Horror fans proved their interest in this series of films, believers will find comfort in the power of faith and I hope there are more films like this coming. There is evil in the world and it does prey on the most vulnerable. Faith and the courage are the greatest weapons against such dark forces. Light shines forth in the darkness.